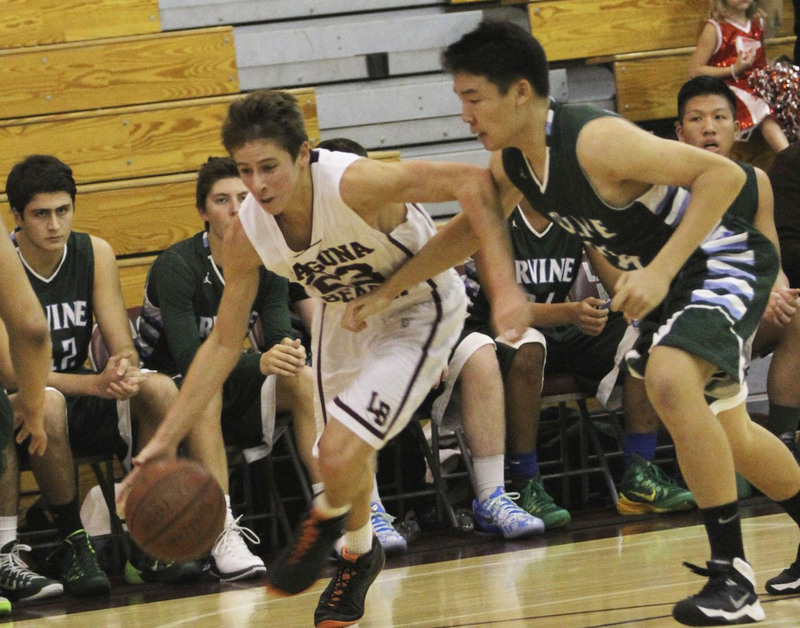 Junior guard Isaac Wulff scored a team high 17 against Irvine at Dugger Gym on Friday, Dec. 12. Isaac Wulff returned to the court last week and the young Breakers (no seniors in the starting rotation) pulled off a pair of non-league wins at Dugger Gym. On Wednesday, Dec. 10, Charlie Rounaghi’s three-point shot took a while to drop with only 23 seconds remaining, but the basket gave Laguna a 44-42 lead. That capped a late comeback from a seven point deficit to a 45-42 victory over the Dana Hills in the 40th meeting between the two neighbors. Darin Richardson’s three-point shot early in the fourth period was also key in the comeback that saw Laguna outscore the Dolphins 14-7 in the final period. Blake Burzell led all scorers with 18 points while Wulff had 11. On Friday, Dec. 12, Laguna took advantage of Irvine’s fouls to convert the free shots to an easy 53-45 win over the visiting Vaqueros. Isaac Wulff hit for 17 points while Blake Burzell was sent to the line for most of his points scoring 16. Laguna now leads the series 12-7. Junior forward Darin Richardson puts up a jumper during Laguna’s 53-45 win against Irvine at Dugger Gym on Friday, Dec. 12. Laguna faces Yorba Linda on Friday, Dec. 19 at 6 p.m. in the Oxford Gym. The playoff game of the week-long Oxford Tournament will be Saturday, Dec. 20, depending on the week’s results. Next week, Laguna will face Ocean View on Monday, Dec. 22, at noon at El Toro in the annual North South Challenge before taking a holiday break. 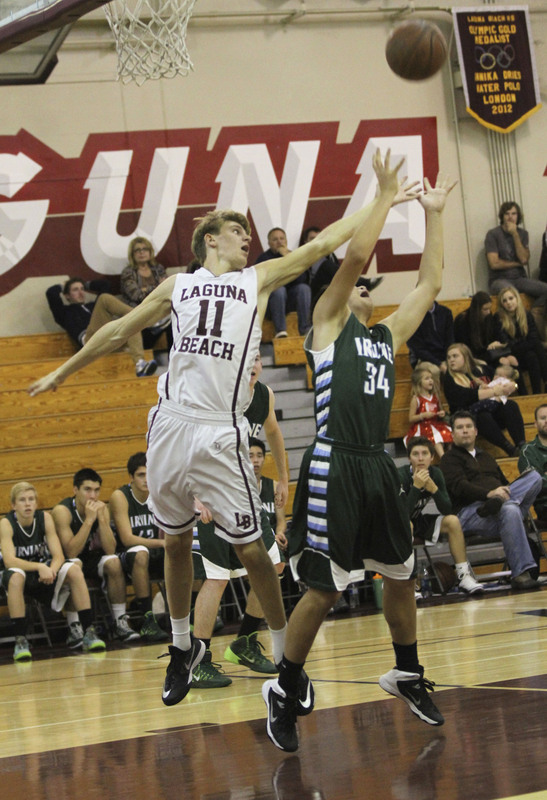 Laguna completed their run at the Ocean View tournament with a string of tough losses. After crushing Dominguez (Compton) 66-30 on Tuesday, Dec. 9, the Breakers dropped three straight losing 44-37 to Santa Ana Valley, 47-42 to Magnolia and 36-33 to Saddleback. Against the Sentinels of Magnolia on Dec. 13 , Alexandra Lewis hit on 10 three-point shots for a team record, but the Breakers blew a 25-15 advantage in the second half for the loss. Lewis was held out of the game against Saddleback on Dec. 13, which was another last-period Laguna meltdown as the Roadrunners came back from a 25-20 deficit to win the game. Sydney DeCarlo scored 15 points and had 15 rebounds to lead Laguna. Breakers faced Newport Harbor on Dec. 17 and will play Capistrano Valley on Saturday, Dec. 20, at 3 p.m. in the North-South Challenge at Mission Viejo. Breakers will travel to San Diego after Christmas for the So Cal Holiday Prep Classic opening Friday, Dec. 26 at 3:30 p.m. at Valhalla High School. Breakers continue play on Saturday, Dec. 27, at 11 a.m. facing Canyon Crest at Bishops School in La Jolla and will play Knight on Monday, Dec. 29, at 6:30 p.m. at West Hills in Santee. Their final game will be on Tuesday, Dec. 30, against San Pasqual, 12:30 p.m. at Valhalla High School. Bruce Knill and Willy Wheeler each scored in the first half to give Laguna their first win of the season, a 2-0 shutout Friday, Dec. 12, at Tesoro. Breakers dropped a 2-0 game this past Monday, Dec. 15, at Aliso Niguel and have two more matches scheduled this past week, weather permitting, hosting Beckman on Dec. 17 and Santiago/Garden Grove on Dec. 19. Breakers also lost a 3-0 match to Trabuco Hills on Wednesday, Dec. 10, at Guyer Field. 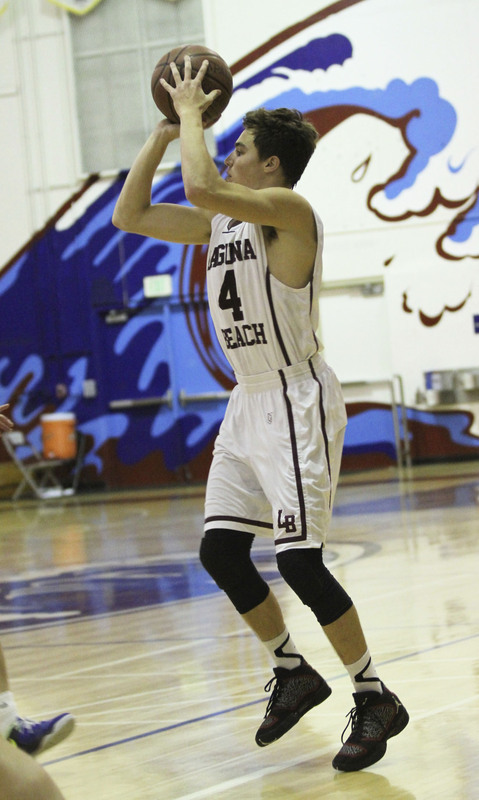 Laguna is off for the holidays and return to play on Wednesday, Jan. 7, hosting Crean Lutheran. Bill Rolfing’s squad played two matches last Saturday, Dec. 13, a disputed contest against La Mirada in the morning on the Matador campus and later dropped a 2-0 contest to Brea-Olinda in a match played at Tustin High School. In that contest, the Wildcats scored twice in the second half to win. Freshman forward Renee Thomas in action against Sage Hill on Dec. 9 at Guyer Field. Laguna played Ocean View on Thursday, Dec. 18, and travel to the desert to play Xavier Prep on Friday, Dec. 26 and Indio on Saturday, Dec. 27. Breakers resume play in 2015 with their alumni match on Jan. 3, and a pair of non-league matches, San Juan Hills on Jan. 6 and JSerra on Jan. 8. Laguna faced Riverside’s ML King, the third-ranked Division III squad on Tuesday at the local pool as the Breakers continued their quest for an undefeated season. The squad was missing two starters (Natalie Selin and Aria Fischer) and their absence seemed to reflect in the slow start for Laguna. Makenzie Fischer’s quick steal and goal in the first minute seemed unable to give the squad any momentum, missing a number of shot opportunities. The Breakers defense stifled the Wolves, but King finally tied the score on a power play situation with just over two minutes remaining in the first period. Fischer scored a penalty shot and another with just 25 seconds remaining to extend the lead to 3-1 in the first period. After an exchange of possessions, Fischer scored again as a long pass from Holly Parker was placed perfectly to the sprinting senior for the uncontested score. Bella Baldridge made it 6-1 followed quickly with another goal as Daniela Lucidi ‘s steal and pass made it 7-1 with three minutes remaining. Goals by Fischer and Mia Salvini made it 9-1 at the half. Laguna also controlled the third quarter though King earned a second score near the end of the period. Taylor Julson added another Laguna goal to make it 15-2 entering the final period. 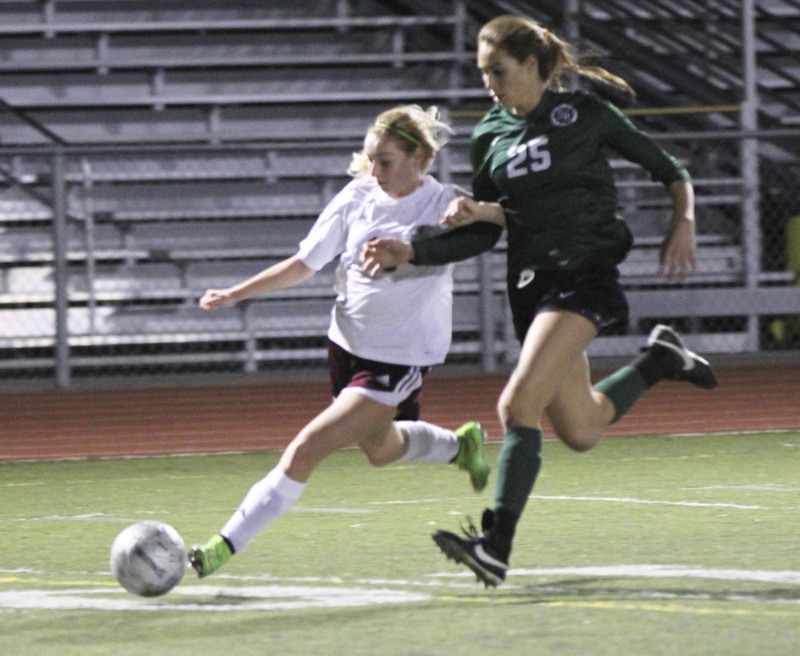 The bench took over with a goal by freshman Sophia Lucas as Laguna cruised to a 21-2 finish. This past weekend, the illness depleted JV team finished third in the Irvine Varsity El Nino Cup. The squad under Coach Trevor Lyle missed key freshman shooter Delaney Gendron. Breakers opened play on Friday, Dec. 12, defeating Division II’s ninth-ranked squad St Lucy’s 8-5 as key goals by Danielle Borelli and Alana Evans helped preserve the win. In the evening game, Laguna blasted Rancho Buena Vista varsity from Vista 14-4 with Isabel Riches and Gabi Beran leading the scoring with four goals. On Saturday, Breakers lost to eventual champion La Jolla 8-7 in a contest undecided until the final seconds. The Vikings went on to easily defeat Arroyo Grande, the top Division 3 team while the JV defeated the host, Irvine varsity, 12-5 for third place. Thea Walsh was key to the Laguna defense with numerous saves as the keeper. Against King, on Tuesday, Dec. 16, the JV scored 13 in the first period to cruise to a 23-0 win. Up next for the varsity is a Saturday, Dec. 20, contest with the top rated Trinity League team as the Breakers will meet Orange Lutheran, 11 a.m. at the Santa Margarita Pool. The squads return to the Laguna pool on Tuesday, Dec. 23, as Newport Harbor faces Laguna with the action starting at 3 p.m. Newport and Olympic legend Bill Barnett is in his final year of nearly 50 years with the Tars. The Laguna resident has coached both the boys and girls programs at Harbor never missing the playoffs.